The overarching aim of RESPONDER is to understand how hydrological networks evolve over seasons and multiple years, and how this evolution impacts on the flow of Store Glacier. To address this aim, the team is implementing the processes of subglacial hydrology in 3D computer models of Store Glacier. The processes include water flowing in small cavities between the ice and the underlying bed as well as larger conduits forming as a network of channels. At present, there is paucity of data to inform how and when channels form, and how cavities open in the first place; yet, variations in the flow of glaciers indicate that even large glaciers, such as Store Glacier, respond sensitively to hydrological forcing at their bed. In RESPONDER we are exploring the base of Store Glacier directly, through boreholes drilled to 1 km depth. We are therefore collecting a unique set of wide-ranging data, which help us develop better process parameterisations for hydrology in ice sheet models. Our ultimate aim is to be able to use the models to make predictions about the future behaviour of Store Glacier and, in due course, the entirety of the Greenland Ice Sheet. Marion’s work focuses on how the input of surface meltwater to the bed may change the speed of Store glacier’s flow, mainly from altering the physical properties (e.g., the slipperiness) of the bed of the glacier, which in some places are comprised of soft sediment. The team is exploring the possibility that subglacial water-sediment interaction is especially important at the inland site where thicker ice and flatter surface hinder the formation of subglacial channels at the bed. 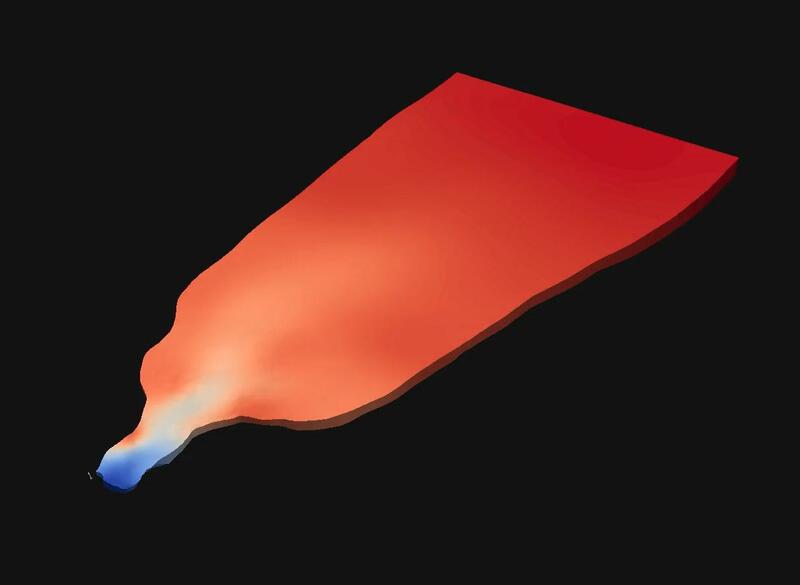 Samuel is using the 3D, full-Stokes finite element model, Elmer/Ice, to investigate Store Glacier by developing a coupled ice-hydrology-calving model that brings together several different important processes that so far have been modelled independently. The aim is to develop a better understanding of the interactions between ice flow and the hydrological system, as well as the influence these processes have on the calving mechanism responsible for releasing icebergs into the fjord.